A $25 million gift to enhance the arts at Holy Cross wasn't the only good news for the visual arts department this winter. Two of its faculty members earned important honors, and both credit Holy Cross for incubating their talents. 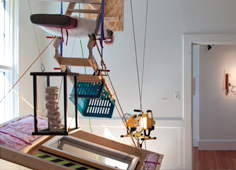 Amy Archambault '08, lecturer and studio supervisor of the College's Millard Art Center, received a 2013 Massachusetts Cultural Council (MCC) grant in sculpture and installation. Notably, the MCC received more than 500 applications and awarded only seven applicants with fellowships. Archambault-whose work "Play Ground-Above" is shown above-says the announcement left her "speechless." Archambault is no stranger to the arts at Holy Cross. A student of visual arts and psychology and a member of the women's lacrosse team, she remembers that, when she first arrived on the Hill in 2004, she "had never seen nor experienced a small campus that felt as expansive." As a result, the College gave Archambault "the ability to discover [her] passions and to pursue them, unafraid of the road ahead." "I ultimately want my students to have the experience that I had," Archambault continues. "The Millard Art Center is home to me, and it's wonderful to be back." Rachelle Beaudoin '04, also a lecturer in visual arts, will travel to Vienna, Austria, next spring on a Fulbright award. There, she will become an artist in residence at quartier21, an internationally renowned center for contemporary art. With contemporary issues in mind, Beaudoin will collaborate with members of Mz. Baltazar's Laboratory-an artistic nonprofit that specializes in do-it-yourself projects-in order to create a wearable technology art piece called "Positive Affirmation Underwear." When put on the body, the bra and underwear will play pre-recorded affirmations such as "You are genuine," and "You are beautiful," with the hopes that such ideology will counter current demeaning social attitudes. "This opportunity will allow me to make connections and artwork with the women of Mz. Baltazar's lab and will allow me to experience the global art world," says Beaudoin, adding that the Fulbright will also give her the opportunity to "work internationally with other artists who have similar interests."